Williams' successful and prolific decade of architectural design got off to an inauspicious start. His appointment as architect of the new Dorchester Hotel, in October 1929, caused a sensation. The Daily Telegraph headline is typical: "Utility in new buildings  the engineer and the architect  who will be master?". All this excitement meant that his eventual dismissal was a dispiritingly high-profile affair. His robust and ebullient character could not long be embittered by the experience, however  he continued to dine at the Dorchester in later years and always, according to colleagues, received particularly excellent service. By the time Williams lost the Dorchester contract, his engineering designs for the highly successful Daily Express building in London were already well under way. Most importantly of all, in the same year he was commissioned as both engineer and architect for the building that is widely considered to be his architectural masterpiece: the Boots Packed Wet Goods Factory. His buildings make plain in three dimensions his stated contention that most architects do little more than decorate what the structural engineer has achieved. In 1931-1932, he also published two seminal articles on the use and implications of his favourite material, The Portent of Concrete and A Concrete Thought. In testing the ideas he expressed against the buildings that followed  among them the Stanmore flats, Empire Pool, Pioneer Health Centre and Dollis Hill Synagogue  critics have found Williams capable of including elements that directly contradict his stated beliefs, particularly about the dishonesty of façade and the redundancy of decoration. On the other hand, as the decade progressed the voices of dissent pointed out that the crudeness of his execution showed that, in some contexts, greater architectural influence might have been preferable after all. Fans as well as critics confess that, in proving what structural engineering at its boldest and most exciting could do, Williams' less successful designs also showed what it could not do. It is, however, overstating the case to suggest that Williams' primary interest was ever in architectural theory or in any particular movement, although more than one has since claimed him. Those who worked with him recall a man who, more than anything, was interested in new challenges and, in particular, in meeting the client's brief in new, better ways. It has also been pointed out that, notably, Williams' clients were overwhelmingly public bodies and major companies  organisations whose priorities were usually economy, speed and function, and very different from the moneyed and cultured private clients more usual for the architectural avant garde. In any case, the long-threatened outbreak of World War II in 1939 coincided with Williams' more-or-less complete departure from the field of building design. There are notable exceptions, for two of his finest buildings are post war: the BOAC Maintenance Headquarters at Heathrow Airport and the Daily Mirror Building in Holborn, London. 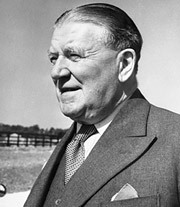 It assuredly did not help that his first major wartime project, the Vickers-Armstrong Aircraft Factory, suffered a dramatic collapse during construction, in 1941. Williams was eventually exonerated completely, but it took him until 1945 to clear his name. In the main, the war effort saw Williams undertaking work on concrete ships for the Admiralty once more. Of his designs, several small Thames barges were built, as were two larger coasters  the Lady Wolmer and the Lady Kathleen, both of which had a working life of several years. In the latter years of the war he turned his hand to a number of projects that addressed the growing need for cheap, speedily produced homes. His fully transportable house unit, the mobil home, is apparently the only scheme for which he ever worked with aluminium. For prefabricated housing, he designed a variety of systems in precast concrete. The man the papers called "Concrete Williams" had, by this time, a knowledge and understanding of the material that was unsurpassable. 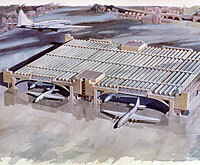 Watercolour of the BOAC Maintenance Headquarters complex at Heathrow Airport.